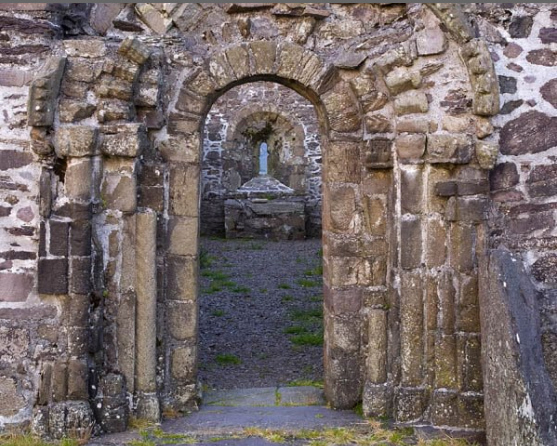 Romanesque architecture was introduced into Ireland from the Continent in the twelfth century and here it flourished. 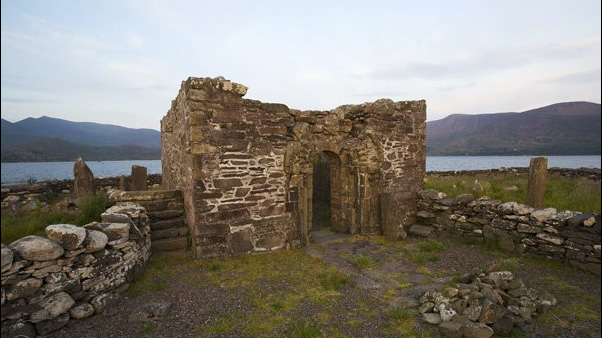 Twelfth century Ireland saw an upsurge of church buildings and the borrowed Romanesque style was soon re-fashioned and given a peculiarly Irish cast. 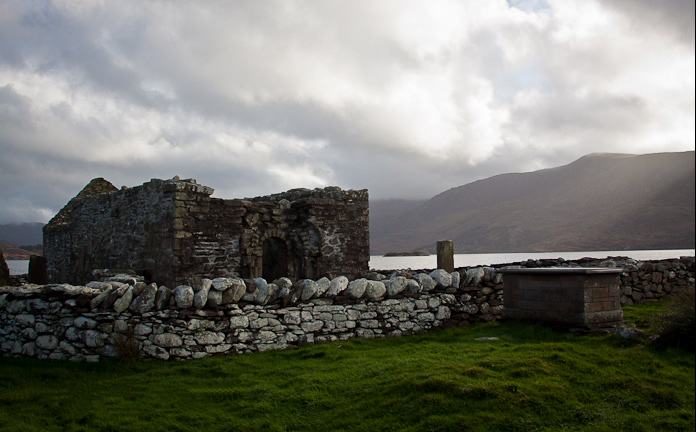 The small size of Irish Romanesque churches, as well as the fantastic animals and severed heads used for ornamentation, distinguish them from their English and continental counterparts. 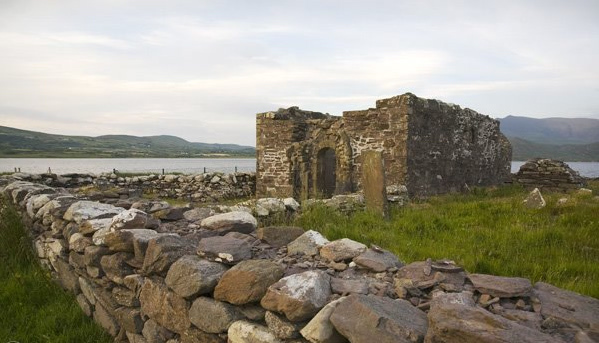 The Romanesque church called St. Fionan’s, on the western end of the island, was probably built during the twelfth century. Its ruined nave (main body of the church), chancel (area near the altar), and doorway still bear some attractive stone carvings of people, animals, etc. Inside the church is the Fidil Stone (q.v.) and a human head. On the west doorway, one can discern another head and a pair of swans. Several cross-inscribed stone slabs, some horizontal and some upright, are to be found in the churchyard. The size of the slab varies, as do the types of stone used and the ingenious modifications and extensions of the crosses themselves. 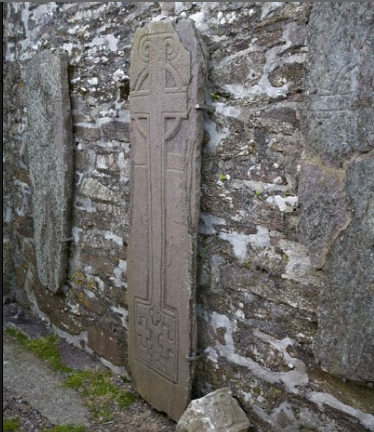 Old Irish writing on two slabs - one located outside the church’s north wall, and the other in front of the west doorway-has been translated as, A Blessing on the Soul of Anmchad and A Blessing on the Soul of the Servant of the Lord, O Buicine King Designate of Kerry, respectively. 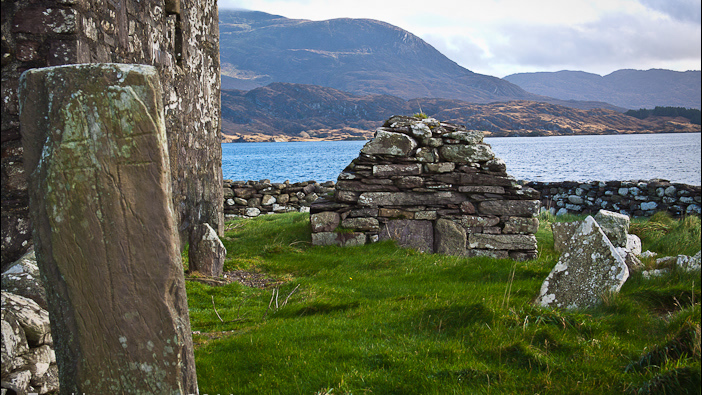 Adjoining the south wall of the church is a tomb covered by a fine seven-foot cross slab. This Early Christian slab was evidently removed from its earlier location and economically re-cycled as a lid for the nineteenth century tomb. 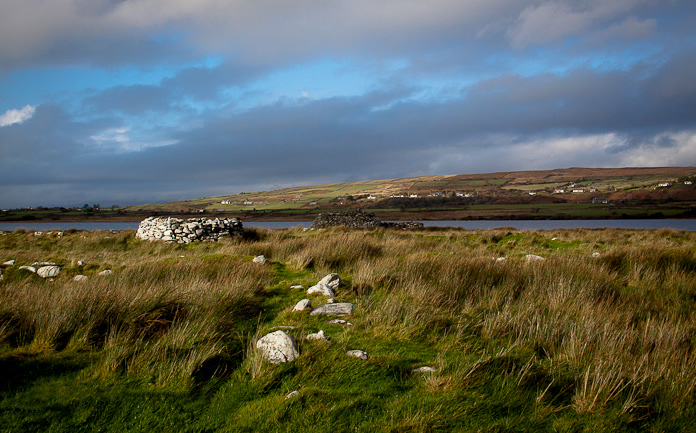 The Church Island group of cross slabs is one of the most important in Munster and testifies to the consequence of this island monastery. 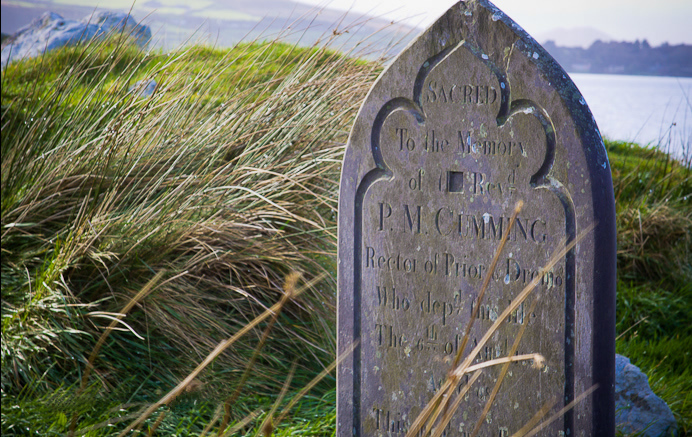 Such slabs mark the graves of eminent ecclesiastics. They also enlighten the modern visitor richly and variously with regard to local Early Christian stone craftsmen’s grasp of design and composition. 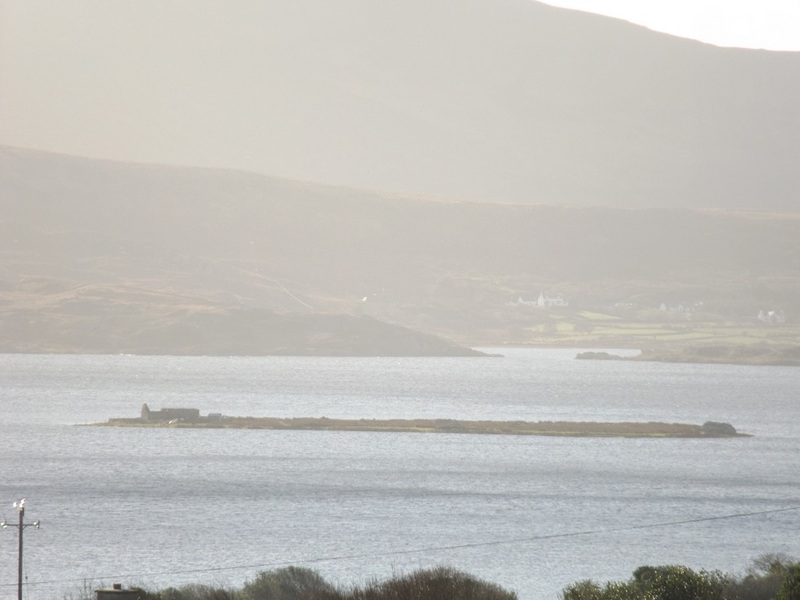 Situated on the western end of the Island, St Fionan’s Cell is associated with the sixth century saint known as Fionan Cam (Fionan the Squint-eyed!). The building measures about fifteen by sixteen feet, being quadrangular on the inside, although, from the outside, it appears to be roughly circular. Large, irregular stones were used in the construction of its very thick walls, which make up in endurance what they lack in elegance. The roof is long gone.